One hot day this summer, Deney, Sarah, Josepha, drove all the way from the Free Press newsroom off West Broadway to Appleton, Wisconsin, ready to learn about space and geology. 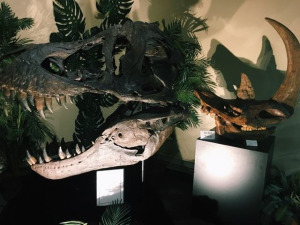 We embarked on this journey to attend the annual Wisconsin Space Grant Conference, titled “Uncharted Lands: Geology and Space.” While we were in the city, we visited the Weis Earth Science Museum to learn about fossils, rocks, and minerals. The Museum is named after Leonard and Donna Weis, who donated the first gift to the Weis Earth Museum and later became its directors. Joanne Kluessendorf is the museum’s founding director. All of the exhibits in the museum were donated by T. John Barlow, Clyde Stephenson, and Donald G. Mikulie. Barlow, a long-time resident of Appleton, donated his collection of award-winning minerals to the museum. While Stephenson donated a large collection of minerals which he acquired on his trips around the world. Mikulic, a geologist from Illinois, gave the museum a variety of fossils. When we arrived at the museum, we began our tour. The museum had many exhibits that caught our eye, from the making-of-earthquakes display, to a mine tunnel filled with beautiful rocks and fossils. Our favorite exhibit was the fossil display. Here we saw fossils from dinosaurs and other creatures from millions and millions of years ago. We were able to touch bones and imagine how they once belonged to bodies that roamed the Earth. At the Weis Earth Science Museum, we learned a lot of new facts about the world around us! And we got to see things we never thought we would see up close! It was a great experience, and we look forward to visiting again soon. This story originally appeared in the Simpson Street Free Press. This article was written by Yoanna Hoskins and Josepha Da Costa. Yoanna is an eighth grader at Sennett Middle School. She has written and published articles since she was in sixth grade. She enjoys practicing Karate on her free time. Josepha is an eighth grader at Saint James. This will be her second year with Simpson Street Free Press, her favorite thing to write about is health. Every year, over 800 Wisconsin parents, youth, teachers, school faculty, and community members come together to attend Urban League’s Martin Luther King, Jr. Youth Recognition Breakfast. Long-celebrated local out-of-school program Simpson Street Free Press is celebrating its 25th anniversary in 2018 with several programs that connect students with the greater Wisconsin community. At their core, SSFP’s anniversary projects embody the mission that the organization has been promoting for 25 years—challenging achievement gaps through out-of-school, high-impact literacy training.